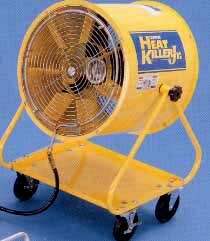 The Heat Killer Jr. incorporates characteristics of the Double Duty Heat Killer to a smaller, lighter weight design. This durable air mover is suited for product/process and personnel cooling and is versatile, lightweight, and easy to move. It's a superior quality and air mover designed to fit any budget. Fixed guide vanes direct the air flow into a powerful concentrated blast. Tough steel casing can be positioned at any angle to provide air flow where it is needed. All steel components are safety-yellow epoxy powder coated for added wear resistance. Heavy duty casters, front locking. Convenient tool tray under casing. Protective screens meet OSHA standards. 1/3 HP TEFC motors, 1750 RPM, equipped with 8 ft. heavy duty cord. (115V models have plug.) On/off toggle switch on motors. Note: 2 speed motors also available.